Like the Caribou, Canada’s most recognized national symbol of the far North, the Caribou Twin over Twin Bunk Bed by Stork Craft is a timeless, sought-after piece. Bring this wilderness icon to your child’s bedroom for a true “outdoorsy” elegance that will be adored throughout the years. This bunk bed is smaller in stature and height for that bedroom that is short on space. 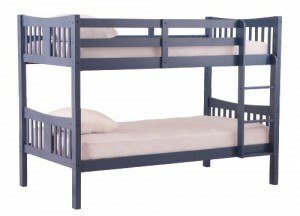 As your child grows, you can easily convert the Caribou Twin over Twin Bunk Bed into two separate twin beds. All Stork Craft bunk beds are designed with security in mind, featuring unique fastening systems, a sturdy fastened ladder and full length guardrails. Compliment your Caribou bedroom look by adding an assortment of matching timeless designed accessories by Stork Craft: a chest, dresser or hutch.